New bandsaw owner? The blade supplied on your machine will not last forever, so eventually you will need to take the plunge and purchase a new bandsaw blade. To save you time and money, take a look through this guide and make the right choice first time. Watch Axminster Expert Craig Steel talk through the production and manufacture of Axcaliber bandsaw blades. Manufactured in Axminster, using advanced CNC machining and specialised heat treatment, Axcaliber offers a wide range of high-quality bandsaw blades designed to meet all requirements. The most obvious piece of information you need to know is “how long is my blade?” This should be on the spec label on your machine, or in the instruction book. If you have neither, please call us for advice. Secondly, you need to choose the width of blade. 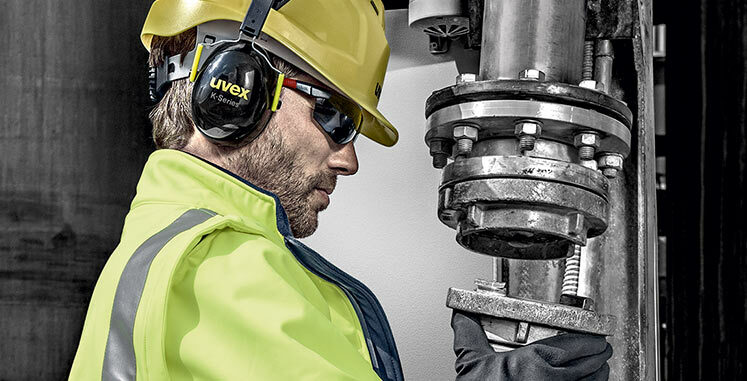 Always use the widest blade possible – it is stronger and will withstand greater feed pressures without flexing. Consult your machine manual for the maximum and minimum blade widths that it will accept. If you are a woodturner, cutting bowl blanks with a bandsaw is both safe and effective. However, you will need to choose a blade that will cut the radius you need. And, don’t forget. A blade used for a batch of cutting bowl blanks will not be much use for straight cutting. Cutting curves will disturb the set of the teeth on the blade, consequently making it impossible to cut in a straight line. So we advise you to keep your bowl blank cutting blades separate from other blades. We also have a specialist curve cutting blade, the Back Tooth blade, for details see below. The third area to consider is tooth form and pitch. This will depend on the type of work you intend to do, i.e. rip cutting (with the grain) or cross cutting (across the grain). Generally, a skip tooth blade is used for rip cutting, whereas a regular or triangular tooth blade is for cross cutting. The skip tooth is provided on coarse tooth blades, those with 3, 4 and 6 teeth per inch; it has a wide shallow gullet with plenty of space for waste to collect. Please note that the quality of the cut can be adversely affected by sawdust packing between the teeth. Used for deep cutting especially rip cuts. 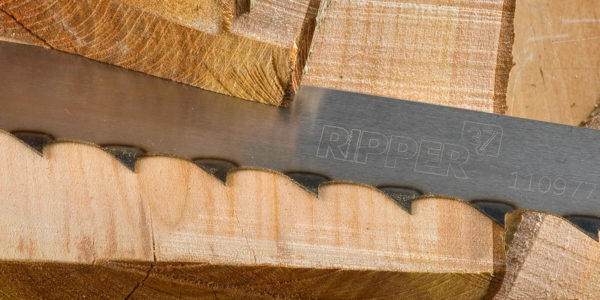 This blade will leave a rough sawn finish although slow feed rate and high tension will improve the finish of the cut. 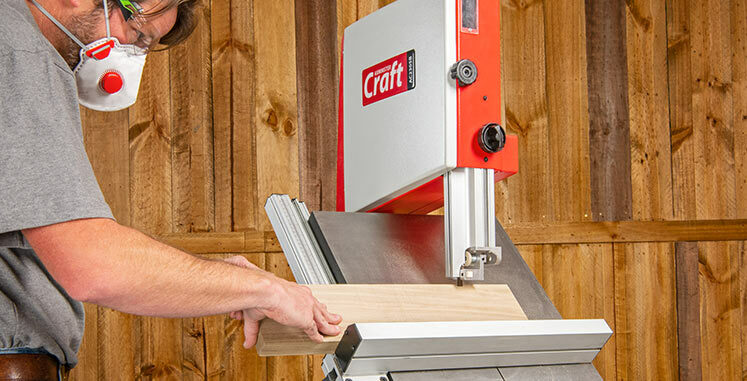 Good for general-purpose use with a degree of cutting across the grain and with the grain. A reasonable finish can be achieved with slower feed rates and good tension. The ideal general purpose blade suitable for cross cutting up to 150mm and ripping in sections up to 50mm thick, although thicker sections can be cut using slow feed. The regular, or triangular, tooth form is provided on blades with 10 or more teeth per inch where, because of the reduced material removal, there is less need for waste storage. 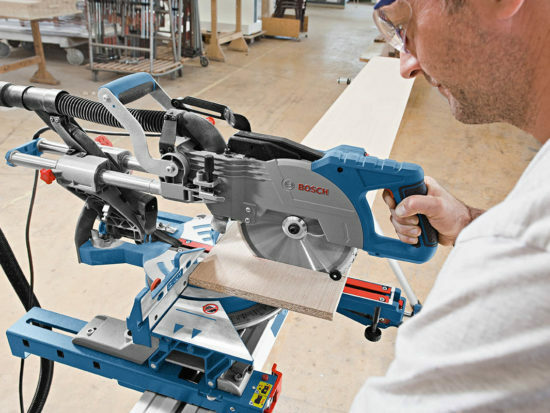 Good for cutting plywood and MDF as well as non-ferrous metals and plastics. The finish is good when cutting natural timbers, but the feed rate should be slow and maximum depth of cut should not exceed 50mm. When cutting metals, reduce the speed as much as possible especially when cutting ferrous metals or cast iron. A very clean cutting blade for plywood, plastics and MDF, although too fine for natural timbers unless they are very thin sections (sub 25mm thick). The 14tpi and above blades are very good to use at slow speeds when cutting non-ferrous metals. A slow feed speed should be used at all times with a blade tooth pitch this fine. Blades with variable pitch teeth (4-6tpi, 6-10tpi and 10-14tpi) are also available for wider ranging applications (see Premium Bandsaw Blades). Now you have made the three basic choices, we will guide you through the types of blades that we offer. Depending on the length of blade required, it can be an easy choice or a little more complex. For machines with a blade length up to 70 1/12”, we supply high carbon blades only. This is because small machines need a highly flexible blade to accommodate small diameter wheels and relatively low power motors. High carbon steel bandsaw blades are often known as “Standard Blades”. Standard blades are best described as general purpose and are fit for all those normal tasks in the workshop where a smooth, good quality, ‘no fuss’ performance is required, day in and day out. Our “Standard Blades” are the unique Ground Tooth (GT) design. This newly developed material is designed for the production user with high feed rates of cutting and is ideally suited to the rigours of running on two wheels. The diamond ground teeth are so unbelievably sharp (they stay sharper for at least 30% longer) that the blades work extremely well in all materials giving an exceptionally high quality finish and clean cut. 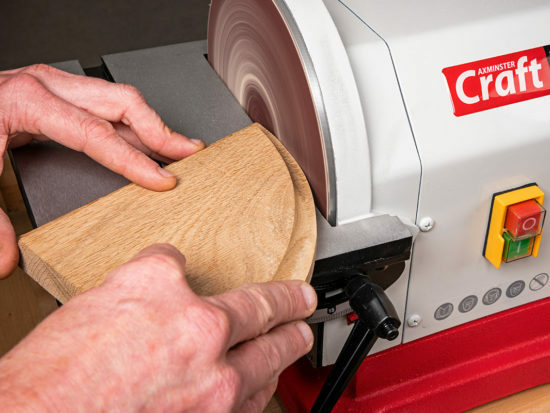 The GT range is designed for general purpose board and cross grain cutting work. Its sister range for rip cutting is the Freshcut 37. The teeth are precisely diamond ground, before going through a hardening process, then annealed for flexibility and finally the stock straightened by a machine process. This produces a super sharp, hard tooth, with the benefits of a long cutting life and a smooth, quiet cut. The teeth have a light set which gives a narrow kerf and reduces the waste produced whilst the hook configuration provides maximum penetration. 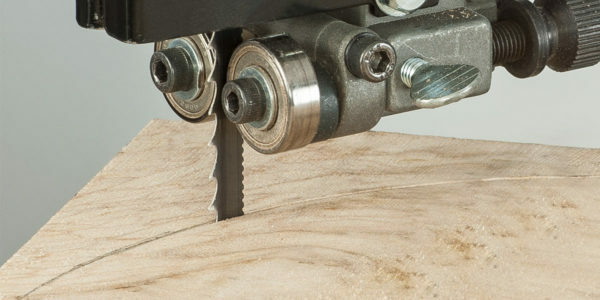 These blades are perfect for ripping all types of timber, producing veneers and boards, the ground teeth retaining their edge far longer than normal milled tooth blades – a unique bandsaw concept. If you hit the occasional nail with your bandsaw blade, it invariably happens just after installing a new one! No longer a problem with these Premium Bandsaw blades! They use M42 High Speed Steel with 8% cobalt which has been welded to a spring alloy steel backing. This results in a material that has a far greater resistance to heat and abrasion, therefore giving improved cutting performance in those materials that might have proved troublesome with a Standard blade. 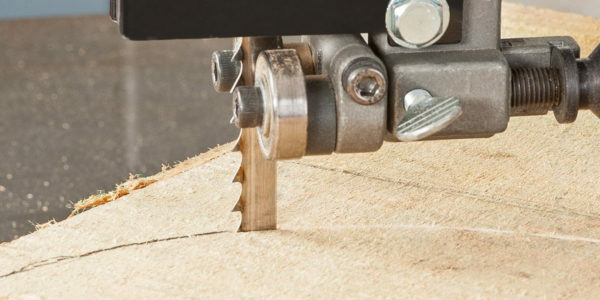 All types of material can be cut with ease, including abrasive timbers such as teak as well as man-made boards like MDF and chipboard, where the glue used has little, if any effect on the life of the blade. 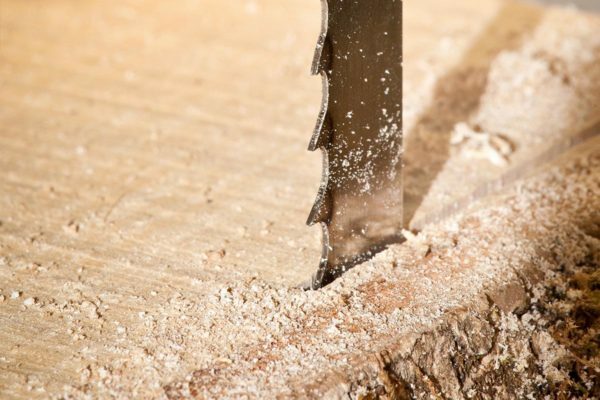 M42 blades are so resilient that reclaimed timber presents no difficulties, as the blade will slice easily through the odd nail buried under the surface. For woodturners, we have a unique blade concept, the Back Tooth bandsaw blade. Woodturners often prepare their own blanks, which is where the back tooth blade becomes particularly useful, as it has been specifically developed for curvature cutting. The teeth on the rear of the blade are not sharp to handle but have the effect of clearing the back of the cut by widening the kerf, enabling a much tighter curve to be cut making them an ideal choice for preparing timber for the lathe. Available only in 8mm 4 tpi configuration which is suitable for almost all machines. For deep rip cutting work we offer the Ripper 37 blade. 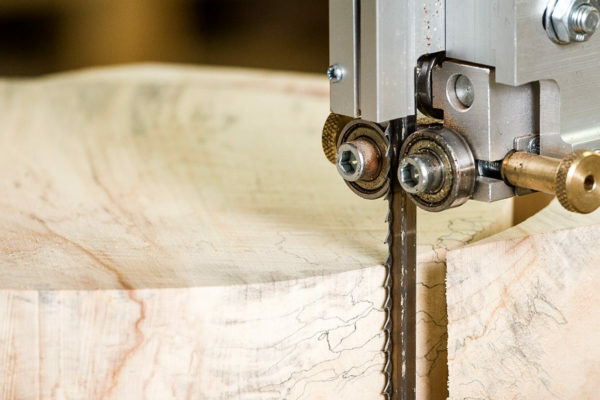 Specifically intended for wood processing and deep ripping tasks, fitting only a few larger machines where motors of sufficient capacity are able to handle the 32mm wide blade. The teeth are precision ground using CNC machinery and then induction hardened. Furthermore, to ensure a very long working life, each blade can be re-sharpened up to twenty times, offering the best possible cutting performance. Where are Axcaliber bandsaw blades made? The answer is, right here in Axminster. All Axcaliber blades are made from UK sourced stock, sized, welded, finished and packed in our own engineering production facility in Axminster. Carefully chosen production techniques and constant quality control checks ensure each blade will exceed your expectations. And if the weld breaks under normal use, we will replace the blade, no quibbles. Steve, I have a Record 250( same machine) and find a 3tpi hook tooth blade with a high set to work very well for bowl blanks, you also should round off the back of the blade so it doesn’t bite as you turn the blank. with this machine you have to make extra sure that the drive belt is tight enough. An alternative is to use one of our Back Tooth Blades (i.e.505169) which are specifically intended for cutting circular bowl blanks. Hello Steve and many thanks for your enquiry. A new blade will certainly go a very long way to improving the performance of your saw and I would recommend the appropriate Diamond Ground blade for your machine. That said, there are things that can be done to ensure the saw is set up correctly, for instance it’s worth checking that the blade is at the correct tension on the wheels (it should make a ‘pinging’ sound when plucked with a fingernail) and that it’s not binding anywhere (you’ll hear it if it is) Also check the alignment of the blade guides and that the saw blade is tracking correctly. The excellent User Manual is available as a download and it’s worth going though it step by step to ensure that everything is as it should be, but if the problem still persists, please don’t hesitate to call our Customer Support on 0800 371822. I suppose this is a stupid answer, but are the teeth acually running the right way, I once remember a customer complaining that (all) his teeth were welded on the wrong way round ! 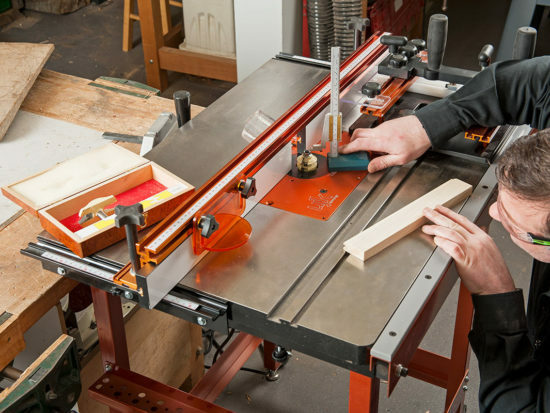 Hi , a few years ago I purchased an Axminster Hobby Band Saw. I tend to use it for the occasional projects, such as making new garden gates, trimming down wood (usually soft wood) and general DIY stuff. I am very much an amateur!! I need to order a new blade and would like to check my details with you. The length of blade is 2240mm and blade wisth is given as 6 – 16mm. I am thinking of buying a Ground Tooth Skip tooth blade, 6tpi, and 13mm in width. Would you agree this would be a good choice? Many thanks. 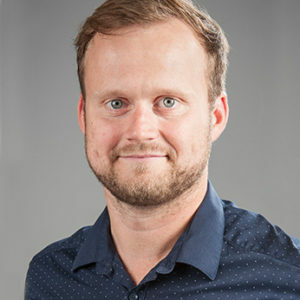 Hello Caroline, I would have to agree that you are making a very good choice with this blade. 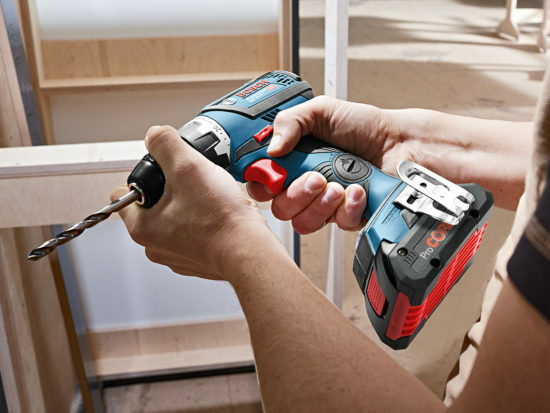 The GT blades are known for their cutting performance and a 1/2′ 6tpi one is the perfect choice for general DIY tasks. Before you purchase one of these though, are you able to confirm which model of Axminster Hobby bandsaw you have? This is just so I can confirm that you need a 2,240mm blade for that one. I’ve owned an Axminster Hobby Series HBS200N bandsaw for the last several months, and generally use it for shaping out curved templates in softwoods and plywood. I’ve been mainly using the original blade provided with the machine for the curved cutting, which is a 6mm, 6 TPI blade. So far, so good! Earlier today, while cutting a fairly gentle curve in a 30mm thick piece of pine, the blade snapped (not at the weld). Do you have any suggestions as to whether a different blade would be more appropriate for this type of work? The blade which broke hasn’t had a vast amount of use, although it may have been getting a little dull. Also, can you offer any tips for setting the appropriate tension in the blade on this particular bandsaw? Over time the stresses on a blade, especially doing curved work will start to cause metal fatigue and can lead to the blade snapping.The best way to minimise this is by ensuring maximum support, with the blade guides as close to the blade as possible and down as near to the work as close as you can get them. Using a dull blade will also increase the stress on it which can lead to breakages. We would say that four months of usage from a ‘stock’ blade is quite good and you could expect to see them last around this time. 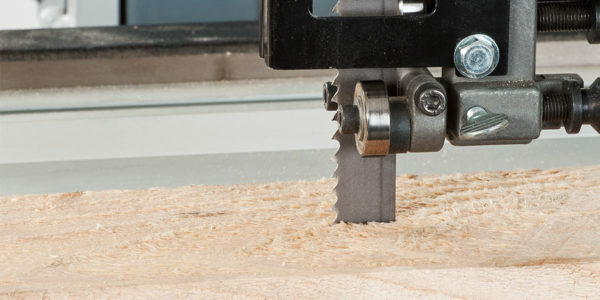 If you are doing mainly curved pieces, we do sell a high carbon back tooth blade, specially made for this type of work, which you can find more information about here… http://www.axminster.co.uk/axcaliber-high-carbon-back-tooth-bandsaw-blades-ax927088. Although we don’t sell 1,400mm size in this type, if you give our Business Services Team a call on 0800 371822, they can place a specialist order for you, for that size, which can be dispatched in 2-3 days. 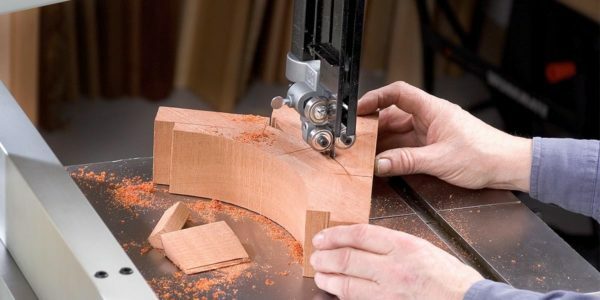 A tip for tensioning this bandsaw is to open the top wheel door, where the blade runs parallel to the spine of the saw, use your thumb to push against the blade towards the spine. If with moderate force you can easily touch the blade to the spine then it is under tensioned. Turn the tensioning handwheel clockwise with your free hand and continue to push on the blade with moderate force until you can’t touch the spine and you should be there or thereabouts. The good news with this bandsaw is that you will struggle to over tension the blade, with the handwheel being quite small. Thank you kindly for all of that excellent advice! I hadn’t realised that I could have a custom made 1,400 mm carbon back-toothed blade, so I’ll place an order for one of them to try it out. Meanwhile I’ve ordered a few replacement blades of various widths / tooth-counts. In general, I’m extremely satisfied with this bandsaw and would highly recommend it to anyone searching for a bench-mounted model. Your welcome, we always try to help out as best as possible. The HBS200N is proving to be a very popular bandsaw and a machine that we are very proud of ourselves, so I’m glad that you are happy with it. If you do get the back tooth blade, I would love to hear how you get on with it in your work. If you see a big difference in the ease of cutting as well as the finish on the piece.